Some are obvious to most of us. Some are known only by credit savvies & experts. The numerical code used to identify the holder of a specific bank account. Any expense such as a debt, wage, or utility charge which has accumulated over time and has not been paid yet. An amount of money which has been earned in a specific time period, but has not yet been received by the person who earned it. Payable or receivable interest which has accumulated over a specific time period, but has not yet been paid or received. A method of calculating interest where the payable sum is decided at the beginning of a loan and added on the main amount. A credit card issued by a bank in collaboration with any kind of other professional organization. Every time the card is used a certain percentage of the transaction goes to this organization. The repaying of a debt in regular installments over a specific time period. To gradually and systematically repay a debt in several regular installments. Any fee charged on a yearly basis, such as the fee cardholders have to pay to their credit card’s issuing company in order to be able to use their card. The rate of interest a cardholder is charged on all or a part of the balance in case the complete sum is not paid until the date it is due. The process of evaluating an asset such as a property (e.g. real estate, business, antique etc.) in terms of its market value or its extent of damage/cost of repairs; the process of evaluating the performance of, for example, a company or an employee; an evaluation document written by an appraisal professional. The charges paid to a professional appraiser for evaluating a property, a performance etc. A document written by an appraiser describing the market value/state of damage/cost of repairs of a property, or the performance of a company/individual. Anything valuable that a company or an individual possesses, such as property, savings, investments, rights, assumptions etc. An individual empowered to access, manage and make decisions regarding a certain account. Loans offered to borrowers with low credit qualifications. Such loans usually have a higher interest rate. A negative qualification of an individual’s credit history, indicating that it might be risky to offer loans etc. to such an individual. The process of transferring debts from one credit card to another. The total amount of money from a bank account or the total amount an individual owes on a debt. An installment of a loan usually paid at the end of a loan period, which is much higher than the previous installments. A legal declaration of an individual’s or company’s impossibility to repay outstanding debts. A number used to rate an individual’s credit worthiness based on his/her financial history. It is generally used by banks to compute the probability of a loan’s repayment and to decide the loan’s interest rates. The number of days between invoicing periods (periods when invoices are prepared and sent). A mistake in a cardholder’s monthly statement as defined by FCBA (Fair Credit Billing Act). An individual or company receiving a loan from a bank/organization. An estimation of costs, revenues or resources over a specific period usually used in order to plan the management of funds. A term used by Debt Management Programs referring to a letter they send to customers after their first payment stating that they need to increase their payment since the creditors changed their policies. A financial arrangement between a creditor and a debtor in which the debtor agrees to pay a large part of a loan in one installment in order to reduce future monthly payments. The total amount of a company’s or individual financial assets, such as savings or investments. A receipt issued by a bank or other depository institution (e.g. credit union, insurance company) to a company or individual opening a certificate- or time deposit-account, stating the deposited amount, the interest rate and the minimum time period the amount should be deposited. Monetary amounts which will remain impossible to collect and must be written off. Private business organizations providing information to banks regarding the checking and savings accounts of companies or individuals willing to open accounts at the respective banks. Legal actions against an individual or company initiated by three or more different parties. A loan in which all the debts and charges are fully paid off in a specified period of time. The final fees paid by a borrower at the end of a loan for a mortgage. They generally include taxes, financing costs, title insurance etc. and range from 2% to 7% of the loan’s total amount. A specific asset (e.g. a building or land) offered as a secondary security by a borrower to a lender in order to secure a loan. If the loan is not paid, the lender is allowed to seize the asset. A delinquent or past-due account which is transferred to a collection agency or department. A fixed or mutually agreed upon fee or percentage paid to an individual or company for initiating, facilitating or executing a transaction. U.S. states such as Arizona, California, Idaho, Louisiana, Nevada, New Mexico, Texas, Washington and Wisconsin, which treat marital income or properties differently from common law states. A loan applicant’s credit worthiness, i.e. his/her credit strengths and weaknesses. Interest rates calculated on the principal amount plus the already accrued interest. In contrast with simple interest, in such cases investments grow exponentially rather than linearly. A loan which is used to pay off two or more previous loans. An individual or company purchasing goods or services from various sources. A fee collected by a third party for their services in the context of a debt collection or legal proceeding. An additional individual or organization involved in a loan and sharing the responsibility of repaying it. Borrowed money under the commitment that it will be repaid within a specific period of time. A card issued by a financial company such as a bank to individuals, offering them the option of borrowing funds and paying for goods or services. Organizations offering assistance to individuals or companies on how to successfully manage their debts. A lending entity who offers individuals or companies money, goods or services which will need to be repaid later. A record of an individual’s or company’s history of managing their credit accounts (including the repayment of previous loans). The head of the lending department of banks or other institutions granting credit to companies and individuals. An organization collecting and selling information regarding individuals’ or companies’ credit history and credit worthiness to potential credit lenders. A number calculated by credit-granting institutions in order to determine, based on credit history/worthiness, whether a particular company or individual should be granted or not a loan. A federally regulated, non-profit financial cooperative offering its member’s various banking services, such as loans, time deposits or credit cards. A creditor’s evaluation of a company’s or individual’s capacity to honorably repay their debts. A directory/list used by debt collection agencies for finding out information about a debtor’s neighbors. Online collections of information. Examples of important national credit databases include those created and managed by companies such as Trans Union, TRW or CSC/Equifax. A card directly connected to a checking account which is generally used to pay for goods or services. Strategies developed by various companies and organizations in order to assist debtors manage their debts. A figure weighing how much of an individual’s income is spent for paying back his/her debts. An individual or company who has borrowed money from a lender. States like Florida or Texas which implemented laws helping to protect debtors from creditors. A legal document by which a grantor (the owner of an asset) transfers the ownership of the asset to another entity. The transfer of the ownership rights for a property from a borrower to a lender to whom that property was mortgaged for avoiding expenses related to foreclosure proceedings. The failure to meet the terms of a contract or agreement, such as repaying a loan in the agreed upon period of time. Loans offered to students to assist them with educational expenses which the students have not been able to repay. An agreed upon period of time in which a debtor is allowed by a creditor to suspend his/her payment of a loan. A testimony or sworn statement provided by a witness in front of a judge or magistrate in- or out-of-court. Being formally released from an obligation, debt or liability, usually conferred in cases of bankruptcy. A deduction from the regular price of goods or products, made in advance of payment. A deposit/fee made in advance by a buyer to show his/her commitment to purchase the offered product or service. A federal law requiring lenders to decide about offering credit to individuals without taking into consideration their nationality, marital status, race, ethnicity, gender or source of income. The distribution of a right or privilege to economic benefits, granted by a contract or law upon meeting certain qualifications. One of the most important credit reporting agencies which reviews and reports to lenders and employers the consumers’ credit history and credit worthiness. A situation arising when a borrower is not able to repay a loan and the lender is foreclosing, seizing and selling the borrower’s collateral. Information which is false, incorrect and potentially misleading. A situation arising when a broker provides to a borrower a loan with excessively high fees and interest rates. Extra and unnecessary up-front and closing charges and fees a lender loads up a loan with. A type of assets which are not at risk of being seized following any legal actions or procedures. Another major credit reporting agency that reviews and reports consumers’ credit history and credit worthiness. A federal law issued by the U.S. Congress in 1971 allowing companies and individual access to their credit reports and the possibility to dispute any inaccuracies or errors they might find there. Payments made by creditors to Debt Management Programs (DMP) on behalf of DMP’s clients. The Federal National Mortgage Association, an organization created by the U.S. Congress with the purpose of buying and selling residential mortgages. An association providing funding to farmers and other eligible borrowers. A branch of the Department of Housing and Urban Development insuring residential loans from private lenders and setting standards for underwriting mortgages. A governmental institution aiming to protect individuals and companies against any unfair financial and business practices. A type of loan that is insured by FHA (the Federal Housing Administration). A credit score computed by FICO (the Fair Isaacs Corporation) which is used by U.S. lenders to predict a borrower’s ability to repay a debt. The charges a borrower must pay to a lender for obtaining the privilege of securing a loan, including interest rates, commitment fees, and other charges. The monetary assistance provided to an individual or company in order to help them with their financial needs. An unchangeable amount of interest applicable to the principal sum. A type of mortgage with a fixed interest rate during the whole period of the payment. A profit strategy of a lender who repeatedly refinances a loan by charging more fees and thus increasing the borrower’s debt and extending the repayment period. A temporary cessation of or decrease in the scheduled payments of a debt. The legal process of seizing a borrower’s collateral in the case he/she is unable to repay a loan. An illegal business procedure aiming to cheat creditors or consumers in regard to their assets, goods or services. The Federal Home Loan Mortgage Corporation, a governmental institution buying conventional mortgages from mortgage bankers and insured depository organizations. A legal process in which a debtor’s assets are seized in order to satisfy an unpaid debt. The period of time in which a debtor can make payments without any additional finance charges. A loan repayment method in which payments increase gradually over time, generally through the employment of negative amortization. The total amount of income before the deduction of taxes and other fees. An inquiry a lender initiates on a borrower’s credit history in order to determine whether to approve a loan or not. An excessive number of hard inquiries can negatively impact a potential borrower’s credit score. A request from a debtor facing financial problems to reduce the monthly repayments and/or the interest rate of a loan. A program initiated by Sallie Mae aiming to reduce the interest rate of a loan for borrowers who pay their installments in time. A negative record in a debtor’s credit reports stating that the debtor repeatedly failed to make payments in due time. An institution or individual that is in possession of a loan, document of title, security, negotiable instrument etc. A second mortgage loan usually secured by a borrower’s home equity. Returned or soon-to-be-returned drafts on a bank account due to insufficient available funding for paying the amount of the check. The total income members of a household possess. Lenders usually review this amount in the case of joint applications for credit. The interest paid by the federal government on loans whose borrowers are still in schools or have received a grace period or authorized deferment. A loan repayment schedule in which the income earned by the debtor determines the amount of the monthly payments. A type of bank which, instead of being associated with a bank holding company, is owned and operated locally. A rate which is calculated by adding a margin to an index level. The latest from the credit reporting agencies, which reviews and reports loan applicants’ credit history and worthiness. A review by a credit reporting agency of a loan applicant’s credit history/worthiness. A type of contract which allows a company or individual to execute payments in several stages over a period of time. A loan which must be repaid in equal installments spread over a period of time at fixed intervals. A fee which is deducted from a loan and must be paid to a guarantee agency in order to provide security against defaulted loans. The process of adding unwanted extra fees to a loan, such as disability insurance, usually without the debtor’s knowledge. A percentage of the total amount of a loan which is added during the loan’s repayment. The limits a debtor’s interest rate can increase or decrease during a loan’s repayment. The highest interest rate which can be charged for a loan. A virtual bank which exists only online and does not have any headquarters at a physical location. A generally low rate characterizing the first period of a loan’s repayment and later on followed by highest rates such as the index or interest rates. A financial organization providing credit cards to customers and offering them the possibility to open bank accounts. Credit accounts which are held by two or more persons who share all the responsibilities associated with these accounts. An official decision provided by a legal court at the end of a trial. An extra fee a creditor charges to a debtor who makes payments after the agreed upon due date. 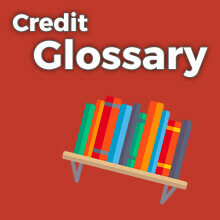 Credit or loan payments which the debtor provides after the agreed upon due date. A solution for managing student loans provided by Sallie Mae in order to simplify students’ and schools’ management of issues related to financial aid. A contract through which the owner (lessor) of an asset grants the use of the asset to another entity (lessee) in exchange for specified periodic rental payments. A company or individual leasing a certain asset from its owner. A company or individual granting the use of certain assets in exchange for specified periodic payments. The legal responsibility a debtor has to repay a debt. A creditor’s right of ownership of a debtor’s asset as a security in the case the debtor is unable to repay his/her debts. The limits between which the interest rate can increase or decrease over the period of a loan in case of adjustable-rate mortgages. An amount of money lent by a creditor to a debtor, usually with an interest rate. A document a potential borrower needs to fill in in order to facilitate a lender’s decision whether to provide or not a loan. A fee associated with loan applications which the borrowers need to pay to the lenders once they submitted their application. The percentage added to an index rate on a one-year adjustable basis in order to reach the fully-indexed rate. All types of regular credit lines, including credit or department store cards, mortgages, bank loans or auto loans. An interest-bearing account offering the account holder an unlimited check-writing ability and, thus, providing benefits similar to those of both savings and checking accounts. A check purchased against a fee from a bank or a retailer which can be used in cases when cash is not accepted. The rate of interest for a credit account which needs to be paid monthly. It can be easily calculated by dividing the Annual Percentage Rate by 12. A legal agreement providing ownership rights of an asset or property by its owner to a lender as a security for a loan. A policy usually required as part of a loan agreement aiming to protect mortgage lenders in cases of default. The maximum monetary sum a consumer may borrow in order to buy a property. The head organization of the Consumer Credit Counseling Service (CCCS). A situation in which the principal amount of a loan increases with the payment of installments due to the fact that the installments paid in the first months were insufficient to cover the interest which is added monthly to the principal amount. The income amount which remains after the deduction of taxes and other necessary charges. An expanded Zip Code allowing the possibility to localize a customer with a greater degree of accuracy than in the case of the usual five-digit Zip Codes. A special tax status exempting certain institutions from paying income taxes and, in some states, sales taxes. A type of debt impossible to eliminate due to bankruptcy reasons (e.g. certain IRS debts or student loans). A computerized service allowing account holders to manage their accounts online in order to make payments, pay bills or view the status of their account and transactions. A type of credit account in which the borrower makes the commitment to repay within maximum 30 days the entire balance. An agreement between a bank and a borrower for lending a specific amount which, once it has been repaid, can be borrowed again. A type of lease which involves an additional payment whose amount depends on the value of the property. The process in which a creditor or his/her agent deals with the initial application processing and disbursement of a loan. A fee a borrower is obliged to pay before the disbursement of a loan. A checking account connected to a credit line or a savings account which permits account holders to write checks for more money than it is available in the account against a finance charge. The largest federal grant program offering to talented student possibilities to secure funding. Student loans with low-interest rates, repayable over an extended time period and funded by the federal government. A payment method through which account holders can pay electronically their purchases through their deposit accounts, without using checks. Points are finance charges which must be paid at the beginning of a loan (1% of the total amount of the loan). Origination fees must be paid to creditors for their initial preparation of the loan. A public college or university savings plan whose value is guaranteed to increase at a similar rate as the increase in the tuition fees of the college or university. The repayment of a loan or a part of a loan before the agreed upon deadline. Charges which are applied to a credit account in case a loan is paid earlier than previously scheduled. A contract or agreement between a creditor and a debtor including the terms and conditions under which the loan will be repaid. A document sent to a creditor by a Consolidation Company providing details to the creditor regarding the amount of money owned by the debtor and proposing a feasible repayment plan. Data available to public from a consumer’s credit report including details regarding foreclosures, bankruptcies, liens or court records. To modify one’s life priorities according to changes in circumstances. Obtaining a new, larger loan which retires an older, smaller loan by using the same properties or assets as collateral. Institutions led by state, federal or local authorities which aim to enforce civil laws. A variable rate in the balloon payment of a loan which, when due, can be refinanced at a higher rate. A system used by postal services in order to track return receipts which should testify the delivery of materials, but have never been retrieved. A voluntary or forced legal surrender of collaterals due to default in a loan’s repayment. The Real Estate Settlement Procedures Act which provides to consumers information regarding settlement costs. A postal receipt returned to the sender for providing information regarding whether the mail has been successfully delivered. A bank account whose holder must provide each month a minimum payment. A card usually issued by major banks and department stores requiring sufficiently high monthly payments to amortize outstanding balances. Programs used by creditors to provide loans to applicants with poor credit histories. Investments, transactions or assets with certain and fully known benefits. Illegal, fraudulent schemes aiming to receive payments from customers for products or services they will not benefit from. Non-repayable funds used for assisting college or university students in their academic pursuits. A system used by creditors in order to determine the credit worthiness of potential borrowers. Organization such as Sallie Mae which purchase student loans from other institutions. A credit card which is secured by a savings account whose balance determines the one of the credit card. A creditor who is secured by certain assets (liens or collaterals) and, thus, in a case of default, can repossess or foreclose on those assets. A loan which is secured by a lien or collateral. A lien or collateral a creditor disposes of in the case of default in the repayment of the debt. A claim or lien securing the fulfillment of a contract created by a security agreement or by law. A monetary amount paid by a seller to a buyer’s creditor in order to reduce the costs of a loan. The operation of combining more loans into a single account in order for the debtor to pay a single monthly bill. A fee a lender charges at the activation of certain services. An individual or institution who manages and collects loan payments (either the creditor or a creditor’s agent). A percentage of the principal sum which is borrowed calculated by dividing an agreed upon additional monetary amount by the initial investment amount. A debtor who is very difficult or impossible to locate by the creditor. A procedure used by lenders and collection agencies to locate a debtor who is suddenly difficult to find (a skip). A prepaid cash card with a limited value known or decided in advance of its acquisition. A loan consolidation plan established by Sallie Mae and helping borrowers to reduce their monthly payments by up to 40%. A nine digits number issued by HHSA (Health and Human Services Administration) and used in order to identify U.S. citizens for social benefits or for referencing school or military records, credit information files etc. Subsidized or non-subsidized student loans issued by the American federal government. A bill usually issued monthly by a creditor including a description of the activity on a certain account. The date when a statement is issued and when finance charges are added. A policy used by creditors for lending credit to borrowers with low credit ratings. Need-based student loans funded by the federal government. Professionals who attempt to sell by telephone various products or services. Banking operations and procedures which are completed solely by telephone. Someone who rents or leases a property from its owner. The period of time it takes until a debt is fully repaid; the lifespan of an investment, asset or liability. A collection agency which is hired by a creditor in order to collect unpaid debts. A savings bank which is regulated by the federal government and specializes in home loans. A policy aiming to ensure a property purchaser against any errors that might occur in a title search. A records examination with the purpose of determining who is the legal owner of a specific asset or property. A major credit reporting agency which collects information about a potential borrower’s credit history and credit worthiness. A federal law according to which applicants for mortgage loans are required to disclose their APR (Annual Percentage Rate). A bank account which has not been paid for an extended period of time (usually from 6 to 9 months). The process of analyzing an individual’s or a company’s credit history, financial records, employment status or liabilities in order to decide whether to provide or not a mortgage loan to such an applicant. Non-need-based student loans granted by the federal government to assist students with their education. A loan offered by the Department of Veterans Affairs to militaries. It is usually a long-term loan with a low payment. The monetary amount an individual pays monthly for various expenses including bills, groceries etc. A loan whose interest rate might change over the time, usually causing changes either in the payment or the duration of the loan. One of the most well-known and internationally widespread credit card types issued by the company VISA USA. A repayment plan for a loan enabling individuals with a regular income to develop a plan for paying their debts during a period of three and five years. The voluntary and intentional relinquishment of various rights, claims or legal advantages. An electronic transfer of funds from one account to another (generally for a specified fee). The refinancing of an already existing loan through a new additional mortgage.